We finally have their decision: they’ve chosen a Nine Elms Bridge location! It’s been a decade in the making with a World class design competition, luscious pictures, PR campaigns & public consultations, the promise of a ‘green‘ bridge for London’s cyclists has now it’s been given the green light. a. the current work programme is paused… the decision to proceed to Stage 3 to be kept under review and brought back to this Committee for approval. 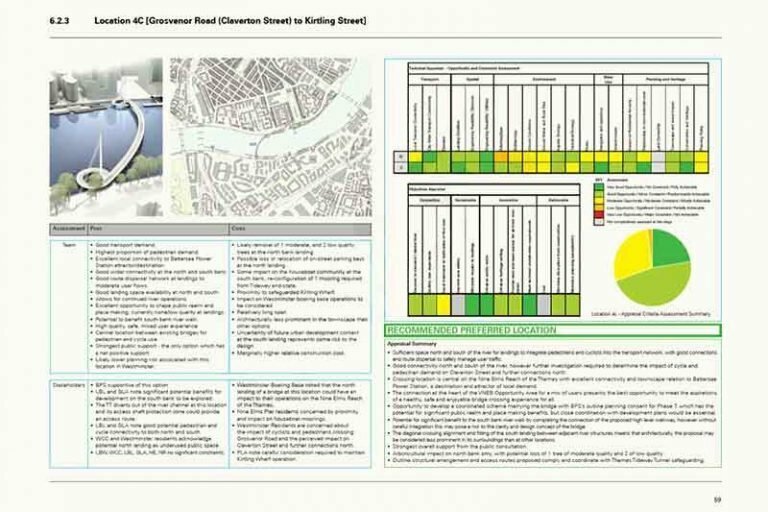 The report revisits and restates the historic blurbs that made the Nine Elms Bridge seem so attractive, and glosses over some of the basic flaws. It goes on to frame the choice of location 4C as the start of the next chapter, Stage 3 Developed Design. But there are no plans or budget for a real bridge. 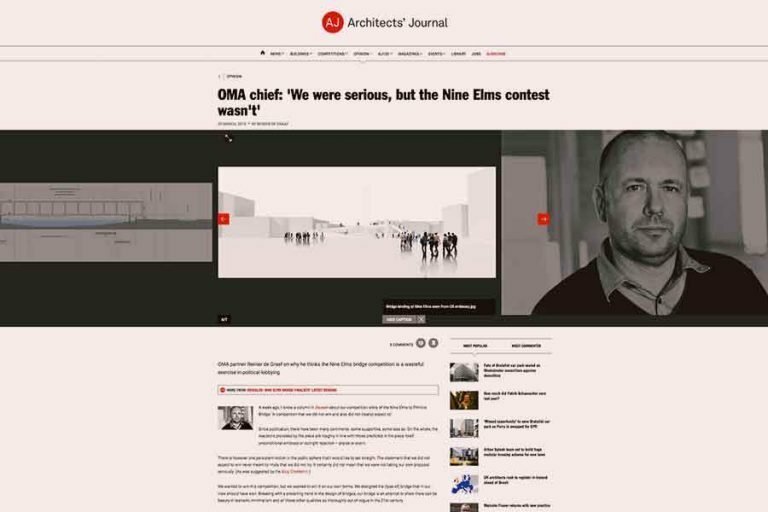 Probably just a nice new design concept and press coverage to aid the Nine Elms property sales teams. Wandsworth still shows the cost of the bridge as £40 million. In the interests of transparency it offers the proviso “at 2013 prices” in brackets. Average construction industry inflation and the longer 4C span would increase it +£60 million in 2019. The original £40m was a guesstimate made years ago using simple, generic bridge designs and doesn’t include all the other costs. This much quoted guesstimate, and the £26m Wandsworth imply they’ve already raised, have never been examined, revised or re-estimated in all those years. London’s Cycle Superhighways get some stick for being too expensive at £2-3 million per mile but represent far better value for cyclists. Bridge expenditure to date is £1,57 million, probably mostly spent on the design competition and PR, and a further £797,000 will go to the team in 2019, bringing the total spent to about £2.4 million. Public money has effectively been spent to help the Nine Elms property developers sell investments to wealthy foreign buyers. The Bridge campaign was a brilliant PR and marketing exercise, but has it really helped London or its cyclists? The recommendations of the report will be voted on 13th Feb 2019. Architect Reinier de Graaf had a couple of interesting articles about the Bridge and the design competition back in 2015. Here are some excerpts. Upon public release of the 74 entries (still known only under their code names at that point), CityMetric, a London-based blog, featured a list of “the 12 most ridiculous designs for the new Battersea Bridge“. Ours was firmly ranked number one, described as “The one that is definitely not a bridge”, followed by “a helpful tip to architects: you can’t just draw squares on a photograph and call it a design.” In terms of sarcasm, we were in no way singled out – English humour is wonderfully indiscriminate in that respect. Considering the comments made about other entries: “The Millennium Bridge with sprinklers” and “Why cross straight, when you can go on a 200 meter detour?” we considered ourselves lucky, even encouraged by how apparently well our intentions had been understood. 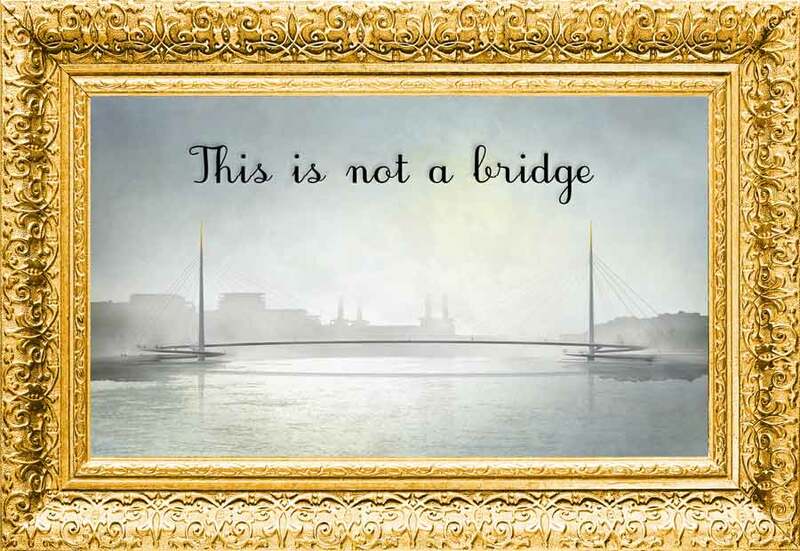 The Nine Elms to Pimlico Bridge competition is part of an emerging trend whereby competitions no longer serve their original purpose: a meticulous selection of the best possible building, but increasingly serve as promotional campaigns in the context of a political lobby. Competitions fill a void left by a public sector increasingly short of means, who, in an effort to save costs, defers an ever greater part of its responsibilities onto the private sector (In this case architecture and engineering firms). However, if this competition is anything to go by, it remains to be seen if they really will. It is exactly this type of media geared competitions, which, in calling for ‘landmarks’, end up causing a lot of public hassle in the process. In soliciting extravagant designs, they inevitably solicit extravagant public expenditure. 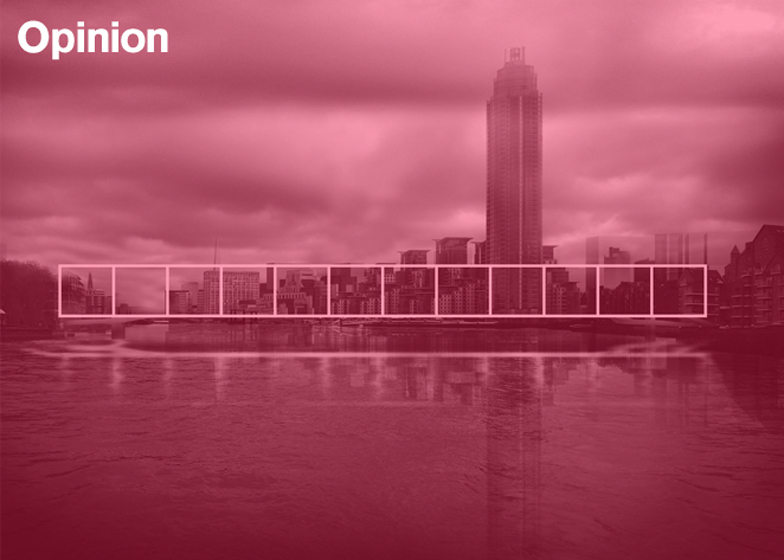 Separator image Posted in Planning and tagged with bridge, nine elms, transport, wandsworth.